It’s been a busy month for my own writing – more about that at the end of this post – but first here are book reviews of my latest good reads. An intruder – nicknamed the Fox – prowls an English village, entering houses and taking low-value items. One day a much-loved resident disappears. Has the Fox claimed his first victim? This is a character-driven literary mystery told from the viewpoints of some of the villagers: Dolores, the spirited girl who’s married well but unhappily; lay reader Jim who wants to atone for his past by becoming a vicar; local bobby Brian who’s known most of his neighbours since they were children together but now realises he doesn’t know them at all; and supermarket manager Stan with his own share of inner conflicts. This literary mystery is a satisfying read. I would definitely read this author again. Well… Force of Nature is … a force of nature. Great premise for a novel – I’ve never fancied one of those team-building retreats and now I know why. Richly evoked setting of the Australian Bush – snakes, dense undergrowth, cold rain and possibly the odd serial killer lurking. Clever, clever storytelling with two timelines a few days apart revealed in alternate chapters. We see just how a group of office workers can descend into Lord of the Flies territory in a matter of hours and still be affected by the twenty-first century problems they’re supposed to have left behind in the city. I haven’t read The Dry but will be making it a priority now. Jane Goodwin’s life is perfect. She’s the doctor’s wife and queen of the school run. Perfect husband, perfect children, perfect home. But when the teenage girl next door is murdered and shockwaves reverberate through the middle class community, Jane finds herself questioning just how perfect her life is. I loved Phoebe Morgan’s first novel The Doll House and she’s followed it up with something equally good but completely different. She expertly blends the toxicity of a bad marriage and the claustrophobia of a small town with a murder investigation. Domestic noir and police procedural served up in one delicious helping. The author sent me a proof copy and I was delighted to provide one of the pre-publication book reviews that predict this novel will be a great success. A woman cyclist is killed while riding along a London towpath. The only witness is a gifted, young artist who is rendered mute by this horrific sight. Police call in clinical psychologist Dr Samantha Willerby to get the art student speaking again. But with little chance of meeting the police’s deadline of one week and struggling to create a rapport with her patient, Sam has no choice but to carry out her own investigation. I felt I was in safe hands with this author. She knows how to put together character, plot and setting. This story expertly combines psychology, art and houseboats. A satisfying read. In Australia a man approaches Kim at the end of a photography class she’s just given and tells her she was an American toddler who disappeared from her home in Kentucky 28 years earlier. Kim’s world unravels. Is the beloved woman, now deceased, whom she called Mum really her kidnapper? And where does it leave relations with her sister and step-father? Kim embarks on a trip to Kentucky to discover the truth, little knowing what danger her quest will put her in. Great premise, varied characters (some likeable, some not), dark twists and a smattering of humour in the dialogue. If early book reviews are anything to go by, this will be a big hit. I had a trip to London to meet my agent Marilia and my editor Finn. They treated me to a lovely lunch in Covent Garden. WHSmith Travel have taken The Perfect Neighbours so my husband and I went round photographing it on the bookshelves at railway stations. I got a real buzz out of seeing it next to the Booker Prize winner at Waterloo. The Perfect Neighbours will also be on sale in Asda and Sainsbury’s from mid-December so if you see a couple with a camera lurking in the aisles of a supermarket, it’s probably us. My publisher HarperCollins announced the purchase of my psychological thriller The Roommates for their main crime and thriller list. It will be out in November 2019. It was exciting to see my name in The Bookseller. I’ve been putting together a blog tour for my forthcoming release The Good Teacher. 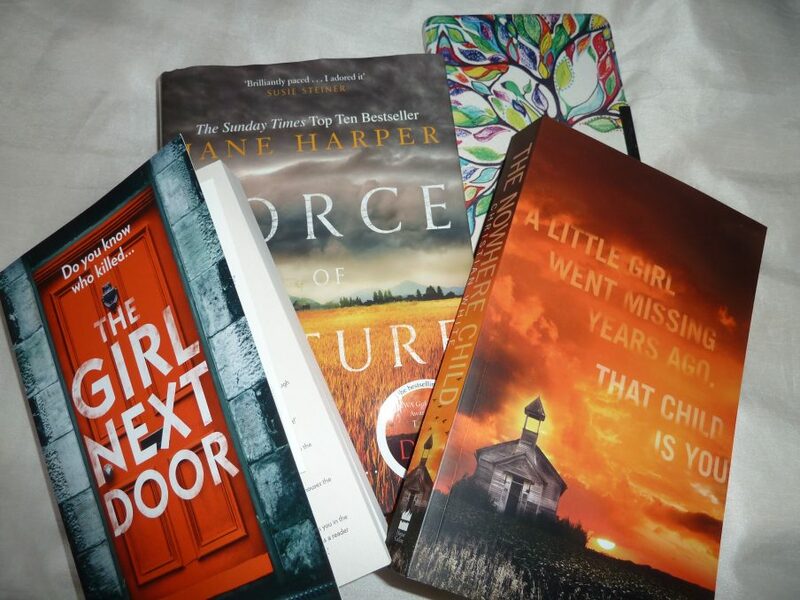 I never cease to be amazed by the generosity of bookbloggers who agree to review and feature books. Three lovely bloggers – Nicki’s Life of Crime, Hair Past a Freckle and Jen Med’s Book Reviews – even helped me out with a cover reveal at very short notice. In my next blog, I’ll be talking more about the bloggers on my tour. The Good Teacher is now available on Net Galley and I have my fingers crossed for book reviews.